Bangor Police Chief Mark Hathaway (left) and other members of the Bangor Police Department shake hands with people, thanking them for their support. 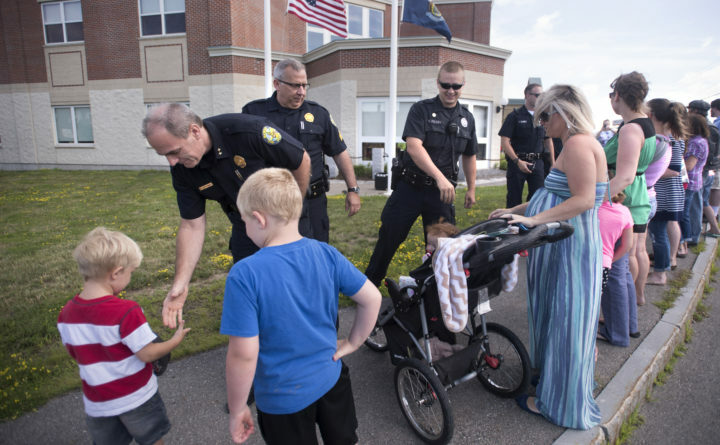 Marion Syversen of Hampden organized the event Lift Up the Blue in July 2016, where over 100 people gathered at the Bangor Police Department to express their support for all law enforcement and first responders in the region. The Bangor Police Department is grappling with an unusually high rate of turnover that has produced one of the youngest forces the city has seen in decades, senior police said. The city has lost nearly a third of its officers since 2013, only about half of whom retired. And while senior police say younger officers are quickly brought up to speed on Bangor’s busy streets, that turnover means a greater percentage of cops are new on their beats and lack the experience and skill that officials say help best serve the community. It takes roughly a year from start to finish before a new officer can begin work in Maine. First, there’s the interview process, then 18 weeks of training at the Maine Criminal Justice Academy followed by three months of field training. However, it takes years of working a beat to build the relationships and intuition that make an officer great. In Maine, there’s something police call the “five-year itch,” when cops are often tempted to move to a different city or agency — or quit law enforcement entirely — and nearly all departments struggle with it, according to a dozen Maine police senior officers. Five years after an officer graduates from the Maine Police Academy, other departments can hire them without being required to reimburse a portion of the $28,000 it cost the original agency to send a cadet to the academy. The first five years on the job test new officers’ commitment, according to senior police. It’s when patrol officers pay their dues and work less-favorable shifts, such as grueling overnights, on forced details and during holidays. “That’s something that deters people,” Ellsworth Chief Glenn Mosier said. But in Bangor, it’s more like a two-year itch, joked Chris Blanchard, Bangor’s senior field training officer. Since 2013, the 79-person department has lost 19 of its officers to other jobs, according to the city. No research has been done to establish what the normal rate of turnover is for law enforcement agencies nationally, according to the International Association of Chiefs of Police best practices manual. But senior police at other large and midsize Maine agencies said they haven’t experienced that kind of turnover in their departments. Several factors appear to be spurring officers to leave Bangor, according to current and former officers. Those include a combination of chronic vacancies, forced overtime and the fact that they respond to an increasing number of calls during the course of a shift. That leads to stressed officers who seek jobs with other agencies or typically better-paying private sector work with more relaxed schedules. “We’re holding our own to staff the agency. But it’s sometimes tough, because the private sector wants people with skill sets, and they offer a bigger [compensation] package,” Lt. Bob Bishop said. Tim Wheelden, 31, left the Bangor Police Department last year for a security job at a bank that pays him nearly double and doesn’t require him to spend holidays away from his young family. He spent five years with the department, including several weeks training as a bomb tech with the FBI’s bomb school in Alabama, he said. “I was stuck between a rock and hard place. I was put in a position to choose between a career that I absolutely loved, with co-workers who were more like a family, or being able to support my family and be financially stable,” Wheelden said. Echoing former colleagues, Wheelden said he didn’t get into law enforcement for the money. But as the job became more demanding, it was hard not to see his compensation rise in a way that felt proportional to the work he put in, he said. Millennial labor force trends are likely playing a role, too. The majority of Maine police officials who were interviewed cited that younger generations are more likely to job hop than ever before. There are no recent data showing how the perceived trend has affected law enforcement, but a 2016 Gallup poll found that 21 percent of people born between 1980 and 1996 changed jobs in the past year. It’s unclear how Bangor plans to address the turnover rate. Police pay can rarely compete with the private sector, and the social problems said to be driving up call volumes — the opioid epidemic, a lack of resources for the mentally ill — have shown no sign of disappearing, Bishop said. As far as filling vacancies to relieve overtime demands, the department has no immediate plans to follow Portland’s footsteps by relaxing hiring standards to include noncitizens and forgive some past marijuana use, he said. Last week, the Bangor Police Department released a glossy new recruitment video that was crafted as an appeal to young millenials with an “internal core commitment to the job, absent wages and benefits,” Betters said. It differs from the action-movie portrayal of police work depicted in the 2011 version. The new two-minute video quickly pivots from a reel of cops performing the exciting aspects of their jobs — detonating bombs, wearing tactical gear — to interviews with officers describing the rewarding feeling they get from helping people in crisis.